South Africa’s favourite outdoor reality cooking series is growing from strength to strength, and Cooked in Africa Films are excited to announce that the pre-production phase has begun in earnest, with series director Andrew Faber travelling the country to find the most beautiful and lesser-known off-the-beaten-track destinations for next year’s competition. 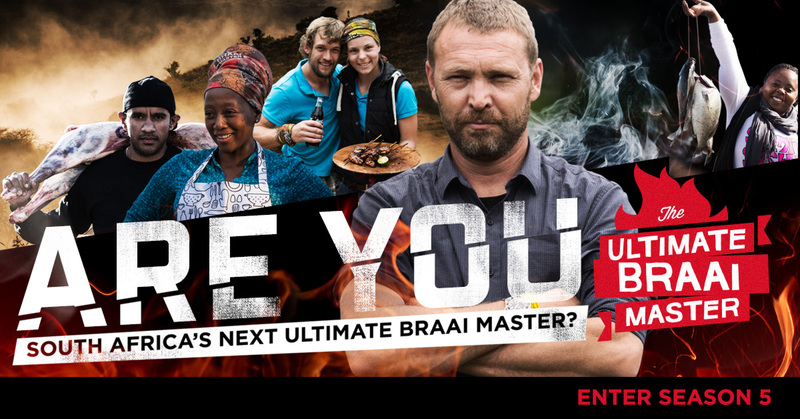 Following the success of the first three seasons of this original, home grown show, Ultimate Braai Master have yet again raised the bar with viewership numbers having more than tripled, with well over a million viewers tuning in to see the fourth season of Ultimate Braai Master, Game On on e.tv every Sunday. The repeats on Saturdays have proven equally popular, and this officially makes the Ultimate Braai Master one of the country’s most watched shows. These numbers aren’t only good news for the producers because by marrying branded entertainment with all the action on the show, it’s great news for the sponsors too. Season 5 of Ultimate Braai Master, sponsored by Game, Coca-Cola, Robertsons Herbs & Spices, Suzuki and KWV is officially on the cards with lots of new tricks and exciting destinations. Entries for Season 5 opened on the 6th of December, so if you think you’ve got braailicious skills then this is your chance to go on the adventure of a lifetime! Go to http://season5.ultimatebraaimaster.co.za/ubm16/ to check it out! Follow them on twitter & facebook.